The book then jumps back to the time of Ashurbanipal (668-627 BCE), a historical king of Nineveh who collected rare literature from around the world (at least the world within reach of himself). It was inside this buried library, which was destroyed in the fall of Nineveh, that the most complete set of tablets for Gilgamesh was discovered. Buried Book tells of Ashurbanipal’s father, who was severely depressed and paranoid. He couldn’t read and was terrified that his assistants were hiding things from him when they read correspondences. Historians believe that this may be why Ashurbanipal was encouraged to learn to read at a young age. I found this section quite interesting and wished that there were more to it than there was. Though I suppose you can’t say THAT much about a historical figure about whom only fragments of records exist. 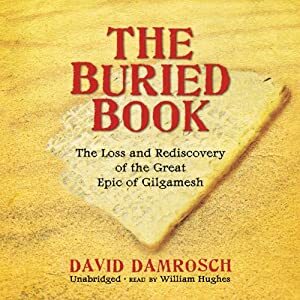 The Buried Book then retreats farther into a short analysis of Gilgamesh with historical perspective. It discusses how the trip to tame Humbaba in the forest may have represented Gilgamesh’s famed war to retrieve wood in other parts of Persia. Finally, The Buried Book jumped back to how Gilgamesh has affected modern readers – including a longish section on Saddam Hussein. Apparently, Hussein could see Gilgamesh in himself and this impacted his philosophy on ruling. I was pretty interested to hear that Hussein had written a decent novel – I had no clue! Of course, chances are someone else wrote it from Hussein’s notes, but still. Very interesting. This sounds so interesting. I tend to really like books about books. Works like this that explore the origins and dig into the meanings of texts such as the Bible, Homer, etc. never cease to fascinate me. Yeah, I have the same interests. Even though the Bible study group is canceled for the year, I'm still going to throw in some Bible study. Though it may end up historical rather than literary if I'm on my own. I think I'm done with Gilgamesh for a while. Yeah, I loved the part about Smith in the book. It was really interesting.